ZEEN101 would like to offer our heartfelt congratulations to Einstein Magazine for their recent recognition in the prestigious Folio: Eddie & Ozzie Awards. The Folio Awards are frequently touted as the top media honor in the digital space. 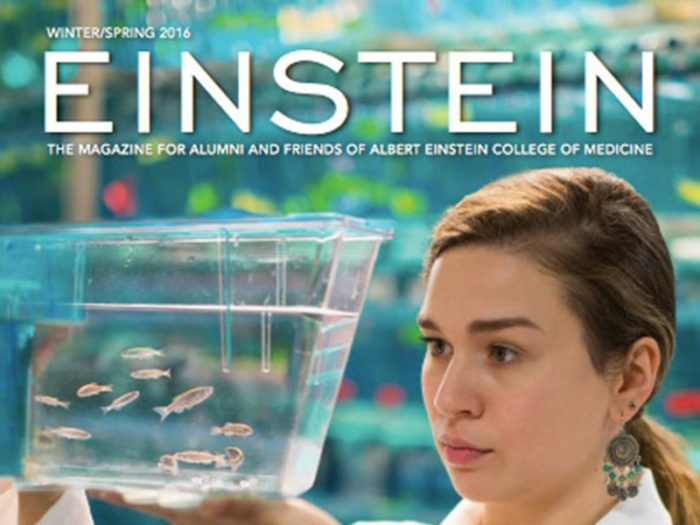 Einstein Magazine, the alumni publication for the Albert Einstein College of Medicine, was named the Ozzie Award Winner for Digital Issues in the Association/Non-Profit category for the their Winter/Spring 2017 issue. This is Einstein’s second recognition in the Folio Awards. Folio Awards are evaluated based on how a digital brand uses creativity and innovation to serve their readership and accomplish their stated mission. 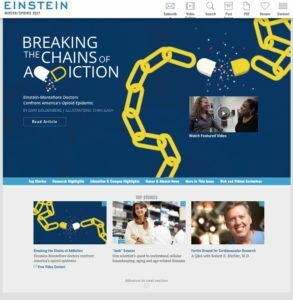 While the outstanding content of Einstein Magazine plays the starring role in their mission to expose their alumni to the evolution of their field, their Folio entry this year focused on recent updates to their digital publication. Einstein runs on WordPress and uses ZEEN101’s IssueM plugin to format and present an issue-based layout. The key benefit with IssueM is that it produces web (or html) based issues and articles rather than using PDFs or flipbooks. This let’s Google index all the articles, lets every article share properly in social media, and the articles look great on mobile devices. The updates recognized and rewarded by the Folio Awards include a number of custom polishes that make the design as user-friendly and accessible as possible: easier navigation, new archive and gallery features, and a more comprehensive video integration. This last – “an innovative interactive popup video feature button for articles that have one or more relating videos, [with] the capability to display one or multiple videos on the article homepage, [and] a small description of the video and the option to read the related article via a link” – was the highlight of their winning submission to the Folio Awards this year. ZEEN101 was privileged to build and integrate these changes to create a truly beautiful and memorable digital reading experience. And, clearly, the media executives that serve as judges for the Folio Awards agree. Ready to create your own award-winning digital publication? Get in touch and see what IssueM can do for you.